Cabin crew working for Scandinavian Airlines (SAS) in Denmark walked out yesterday in what some news reports are calling a "wildcat strike." The walkout was said to be in protest of working conditions. The airline says that the strike is illegal and that the Danish Cabin Attendants Union could face legal action if the crews do not return to work. A Reuters article posted today on Airwise.com said that the strike "had caused significant delays and more than 100 cancellations to and from Copenhagen's Kastrup Airport." SAS said the strike, which is not supported by the airline's union, would mean cancellations of flights scheduled for departure from Kastrup after 1400 GMT, but added that flights to Copenhagen could also be affected. By 1900 GMT more than 100 flights had been cancelled. At least 15 would also be grounded on Wednesday morning, SAS said. 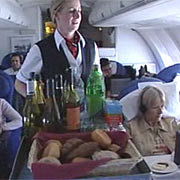 The Danish Cabin Attendants Union (CAU) said in a statement that the strike was illegal and that it did not support it. The union, representing 1,600 Danish cabin crew, has been locked in a dispute with the airline over a new contract. The old contract expired on March 1. An Associated Press report, published this morning on MSN Money and elsewhere, put the number of canceled flights at more than 280, and said that more than 20,000 passengers were stranded. The Norway Post reported that SAS was not able to find hotel rooms for all the passengers stranded at Copenhagen Airport last evening, and more than 400 passengers had to overnight at the airport. The airline handed out blankets and pillows and opened its lounges for elderly passengers and families with children. The Associated Press is reporting that leaders of the Danish Cabin Attendants Union and management representatives met today, but there was no sign of an agreement to end the strike. EUX.TV quoted SAS Denmark spokesman Jens Langergaard, who indicated that the parties would likely meet in court Thursday. SAS Denmark has 2,850 employees including the 1,600 cabin crew. Iris Peterson, United Airlines number one flight attendant, has retired after 60 years of service. Ms. Peterson began her career in 1946, when job restrictions included age, gender, ethnicity and weight. A tribute to Ms. Peterson by the United Airlines MEC of the Association of Flight Attendants notes that Ms. Peterson and her peers helped to destroy these discriminatory practices, advancing the rights of women and uprooting gender discrimination. "Iris has been a mentor to all of us who've followed in her steps," [United AFA President] Davidowitch continued. "She has spent a lifetime committed to her airline and to improving the profession she has loved for six decades. As her fellow crewmembers, we have been lucky to receive her guidance for 60 years. Iris is an intensely private person, but Flight Attendants everywhere are the beneficiaries of her dedication and commitment to our profession. She is truly one in a million." During a recent event at the U.K.'s Imperial War Museum Duxford, several former British Airways Concorde 101 crew members shared their memories of working aboard that historic aircraft. The museum is the new home of the now retired Concorde 101. The aircraft will be housed permanently in a new £25 million AirSpace Exhibition hangar. "It was a very different, a very nice service and very personal," she said. "You had 100 passengers, but you had to give as much attention to them as you could. If they wanted something you got it straight away. "Concorde was not actually first class, but a mixture. It was a prestigious plane to be on - I loved the ambience of it. I enjoyed the speed, although you didn't sense it. I was brought up in a garage so I was always keen on speed! "People were always interesting and there were lots of wonderful passengers. Andy Warhol did not speak to us - he had his own man with him - but he wanted to see the flight deck. We had Eartha Kitt and Peter O'Toole. Quite a few who had been to LA together - Hugh Laurie and Stephen Fry. Joan Collins was a regular. David Frost would always sit in one row at the back of the plane and stretch himself out. "We had Christopher Reeve once. It was always lovely to be able to look after these people. "I was in the crew that took the Queen once, on a State Visit to Ottawa for the 125th anniversary of the opening of parliament." Ms. Sinclair noted that she and her colleagues on the Concorde had the same uniforms as the rest of British Airways cabin crew, but "we had to wear our hats whereas other crews didn't and we had special silver name badges." Cabin crew had new uniforms issued to them for the Royal flight. The Cambridge Evening News article that features the interview with Maggie Sinclair also includes interviews with three former Concorde pilots. Click here to read the entire article. The Transport & General Workers Union (T&G), which represents British Airways cabin crew, announced today that its membership voted to accept a deal on pay, pensions, and a range of other issues. The deal, which was reached following contentious negotiations earlier this year, was approved by a 76% majority vote. "This is a good result for our members, BA and the travelling public," said Jack Dromey, T&G deputy general secretary, who was also involved in the detailed negotiations in January. "The new era of respect for cabin crew is established and we welcome the direct involvement cabin crew representatives will now have with [BA chief executive] Willie Walsh." Earlier this year, BA cabin crew came close to striking over issues of pay, pensions, and sick leave policies. Delta Airlines is seeking flight attendant candidates who can speak, read, and write Hebrew. If you possess these skills and you are looking for a job as a flight attendant, this may be an opportunity you should consider. You must have a high school diploma or GED equivalent, and you must be able to successfully pass a language proficiency test. For more information about this position, and details about how to apply on line, click here. Cabin crew everywhere will be interested to read a report just issued by Britain's Air Accidents Investigation Branch (AAIB) about an in-flight emergency due to smoke inside the aircraft. The cabin crew had to wear smoke hoods during the emergency, but the smoke hoods impaired their ability to communicate with their passengers. According to the AAIB report, on August 4, 2005, a DHC-8-400 aircraft operated by Flybe was en route from Birmingham to Edinburgh with four crew and 56 passengers on board. Smoke developed inside the flight deck and the cabin. The flight diverted to Leeds Bradford International Airport (LBA) where it made a safe emergency landing. Here is an account of what happened, with excerpts from the AAIB report. The incident began when the pilots detected an "oily smell" on the flight deck. They asked the cabin crew, via the interphone, whether the smell was evident in the passenger cabin and, almost immediately, noticed a white/blue haze appearing on the flight deck, accompanied simultaneously by the toilet smoke alarm. The pilots donned their smoke masks and began a smoke checklist. While the pilots were actioning the checklist the two cabin crew members heard the smoke alarm in the forward toilet sound and then found that the toilet was full of whitish coloured smoke. The senior cabin crew member informed the flight crew using the interphone. The pilots' response was delayed because they were occupied with the checklist actions. The cabin crew then donned smoke hoods. At this point, the captain declared a 'MAYDAY' and descended for an approach to LBA. ...The cabin crew were briefed to prepare the cabin for an emergency landing in 10 minutes and a passenger evacuation on the runway. The cabin crew found the smoke in the cabin getting thicker, until they could no longer see the length of the cabin. The senior cabin crew member played an emergency announcement tape and made a public address to the passengers, briefing them that there would be an emergency landing, for which they should adopt the brace position. The cabin crew then checked the passengers and secured cabin baggage. Some passengers enquired about breathing protection for themselves, but smoke protection for passengers is not a requirement on public transport aircraft. The report goes on to note that as power was increased during the approach there was a significant increase in the smoke inside the aircraft. Hearing difficulties caused by the smoke hoods prevented the cabin crew from hearing the landing calls from the flight deck. 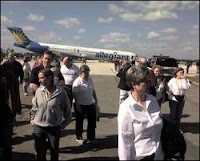 The aircraft landed safely at LBA and the passenger evacuation "proceeded in an orderly fashion." There were no injuries. In their reports on the incident the flight crew noted that, after the emergency had been declared, a high workload had prevented them from communicating with the cabin crew for some time. The cabin crew commented that delays in obtaining a response from the flight deck to cabin emergency calls at times had caused concern as to the state of the flight crew. It was suggested that consideration should be given to introducing a standard method by which the flight crew could confirm to the cabin crew that they were not incapacitated but were temporarily too busy to reply, such as a triple activation of the seat belt audio alert in the cabin. The cabin crew also reported that the smoke hoods had severely hindered ommunications with the passengers, impeding both hearing and being heard. Because of this, one of the cabin crew had removed her hood shortly before landing. Regarding the smoke hoods, the report concluded that verbal communication while wearing the hood was difficult for the cabin crew due to "a reduction in speech and hearing volume due to the hood and to interference from relatively loud sounds perceived by the hood wearer, caused by rustling of the hood, the sound of the wearer’s breathing and the sound of the wearer's voice." The report includes several safety recommendations for improved means of emergency communication between the flight deck and the cabin crew, and for a review of cabin crew training in the use of smoke hoods aimed at the ability to communicate while wearing the hoods. Click here to view AAIB Bulletin: 4/2007 - Bombardier DHC-8-400, G-JECE (10-page 'pdf' file). Low-cost carrier AirTran Airways is looking to hire new flight attendants for its Atlanta crew base. AirTran is looking for individuals who are at least 20 years old, and who have had a minimum of two years of recent face to face customer service experience. Applicants must have a high school diploma or G.E.D. -- two years of college preferred. A second language is a plus. During April of 2007, representatives of AirTran Airways will be visiting the following cities to interview qualified flight attendant candidates: Dallas/Fort Worth, TX; Rochester, NY; Dearborn, MI; and Orlando, FL. For more information about the job, required qualifications, and details about how to apply, visit this page on the AirTran Airways website. Canadian media are reporting that a labor arbitrator has awarded a wage increase of 5% over a period of three years to Air Canada's flight attendants. According to a Canadian Press article published in the Globe and Mail and elsewhere, the flight attendants will get a 2% increase retroactive to last summer, another 1.75% effective this July and another 1.75% in July, 2008. The Canadian Press says that the arbitration was part of a provision in the contracts reached between the company and its unions in 2003 that were required for Air Canada to cut costs and recover from bankruptcy protection under the federal Companies' Creditors Arrangement Act. Air Canada's 6,000 cabin crew are represented by the Canadian Union of Public Employees CUPE). Last month I posted two stories in this blog about emergency aircraft evacuations -- one from the Biman accident inDubai, and another that happened after a rejected takeoff by an El Al aircraft in Tel Aviv. A few days ago I came across another emergency evacuation story that is worth sharing. This event occurred late last month at Orlando Sanford Airport when an Allegiant Air MD80 landed with its nose gear retracted. The evacuation story, which appeared on New Hampshire news website Foster's Online, was told by a gentleman who was a passenger on Allegiant Air Flight 758 that day along with two of his family members. The man, identified as Bill Bryon, explained that a series of PA announcements from the flight deck had informed passengers of a problem with the landing gear. At first the flight crew thought that they could lower the gear manually, but that didn't seem to work. "What was probably the scariest part of the entire trip was when they started to do maneuvers to try to get the landing gear down," he said. "One was called porpoising, where they were moving the plane up and down pretty quickly to try to get the landing gear unstuck. I thought they might be losing control of the plane." "After that, they started banking the plane steeply and moved the rudder to create a dragging effect to try to dislodge the gear. The plane would shudder and make a strange noise and we kind of felt like the plane wasn't in control," he said. These maneuvers apparently did not work either, so plans for an emergency landing were made. "[They told us] that we would have to follow close instructions for emergency landing," said Bryon. "They said there would be fire trucks and emergency personnel waiting for us, so the stakes were getting a little higher at that point and everyone's level of tension rose." "One thing that was amazing was that the passengers were extremely well controlled and cooperative," he said. "I expected there would be crying and stuff like that, but there wasn't. People were asking what was going on, but no one was crying." Bryon said flight attendants instructed passengers on how to brace, "and to remove sharp objects like pens and pencils from their pockets, and to put all watches and jewelry away." "They told us if we had extra jackets and sweatshirts to put them on, and that made us think of the possibility of a fire," he said. They were told to keep their heads down until the aircraft stopped and then stay in their seats unless the crew yelled 'evacuate,' in which case they would leave through emergency doors on the side. As the jet lowered toward the runway and flight attendants started chanting 'Keep your head down,' Bryon said the reality set in. The passenger said that as the plane was descending, he was mentally preparing himself for a crash landing. Fortunately, the aircraft did not crash. The plane touched down on its main gear and the passengers "could feel the grinding of metal on the tarmac as the nose went down and then started to smell the burning aluminum coming in." Then the aircraft came to a halt, and everyone breathed a sigh of relief -- briefly. "All of us exhaled, but when they said 'evacuate,' the fear rose again thinking that there might be a fire to deal with," he said. Even then, Bryon said he was surprised by his fellow passengers. "It was kind of a refreshing look at human behavior," he said. "I was prepared to stand and block the aisle so my wife and daughter could get out, and was expecting a lot of pushing and shoving, but truthfully everyone went row by row and it was calm and orderly," he said. "Normally you tend to be cynical about humans but in this case they were very noble." Bryon said as soon as passengers slid down the wing and were caught by firefighters and EMTs, they all felt an instant camaraderie. "I think everybody was pretty much afraid up there that this might be their last trip, so when we landed there were people hugging that didn't even know each other," he said. "There was this bond there that for a short time transcended petty differences between people. We were just appreciative of being alive." Nice to know that the passengers on this flight were so cooperative. Bravo to the flight deck crew for that remarkable landing -- and for doing their best to keep those in the cabin informed about what was happening during the emergency. And congratulations to the flight attendants for preparing the cabin and evacuating the aircraft so smoothly through the over-wing exits and forward doors. A Collective Labour Agreement between Brussels Airlines and its cabin crew union was reached this week. The reduction of the rotation period from 40 to 30 minutes on certain routes was a particular bone of contention. This new rotation time will stay in force, but in return for certain benefits, such as guarantees on income, the promise of a new assessment system and food-vouchers on European flights, emphasised Anita Van Hoof, the union representative. The article goes on to say that Brussels Airlines cabin crew had been opposing the reduction since the airline's launch. It is not yet clear whether these actions will now be abandoned. A brief item in the Charlotte Observer says that US Airways "intends to call back about 90 laid-off flight attendants to fill vacancies caused by attrition." The comment was attributed to US Airways spokesman Philip Gee, who also said that the flight-attendant recalls aren't related to the airline's growing fleet of Embraer 190 jets. No further details were available. The results of a ballot for a proposed Enterprise Bargaining Agreement (EBA) has been announced by the Flight Attendants Association of Australia, the union representing Virgin Blue cabin crew. A majority (89%) of votes cast by union members have rejected the EBA. Virgin Blue cabin crew have rejected a five-year wage deal put to them by the airline and their own union that demanded "a high degree of flexibility" and unspecified productivity gains from them. In a clear sign relations between the airline and its cabin crew are far from harmonious, 89 per cent of the Flight Attendants Association of Australia's 1115 members who voted on the proposed pay deal rejected it. Despite offering a set of pay rises and bonus payments, the proposed enterprise bargaining agreement required "further agreed productivity gains, accruing as a result of initiatives not already contained in this agreement". The article goes on to say that, compared with Qantas domestic cabin crew, Virgin Blue cabin crew are required to work 15 per cent more hours and, going by the highest pay scale, get around 20 per cent less in base pay. They get paid less and work slightly more hours than Jetstar crews. A Virgin Blue spokeswoman said that the airline would continue talks with cabin crew. SkyWest Airlines, which operates more than 1,700 flights per day for United Express and Delta Connection, is actively recruiting new flight attendants this month. They really mean business: A notice on their website states, "Effective April 1, 2006 an $800 training bonus will be offered to all Flight Attendant trainees who successfully complete training and are actively employed after 60 days of employment." They will be holding group interviews at many locations around the United States throughout April. Click here to view the list of locations and dates. The page also includes links to instructions on how to apply, and an online application.